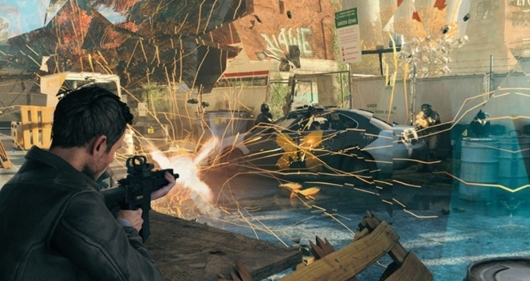 The latest game from Max Payne and Alan Wake developer Remedy Entertainment, the long-awaited Quantum Break, hit store shelves of the physical and digital kind today. The game is quite the ambitious endeavor with Remedy not only crafting a game that delves into the tricky realms of time travel, but also fusing it with TV show-like live-action episodes that play out depending on choices you make in the game. So is this new game worth your time, or should you pass it by? Continue below for our thoughts. The story of Quantum Break isn’t an easy one to summarize, but I can at least set it up. You play as Jack Joyce (Shawn Ashmore), a former troublemaker and the scapegoat of his family who grew up in the shadow of his genius older brother, Dr. William Joyce (Dominic Monaghan). With his parents gone and his relationship with his brother nonexistent, the only real family Jack has had is his best friend Paul Serene (Aidan Gillen), who saw the bad road Jack was on and helped get him out of the country in an effort to avoid him getting into trouble he couldn’t get out of. So years later when Serene needs his help, Jack is there without question. And this is where our game begins. The favor Paul Serene needs from Joyce is no ordinary favor, however. He drops the bomb on Jack that time travel is real, they’ve figured it out, but he’s dangerously close to losing everything he’s worked so hard on and he needs to prove that it works. The only person he trusts in helping him with this is Jack. At first all goes well, and it appears that Paul has achieved the impossible. But then it all takes a horrible turn for the worse. Without giving too much away this sets the story in motion, as Jack finds himself with some unbelievable new abilities and on a mission to figure out just what’s going on and set things right…if that’s even possible. Going into Quantum Break I wasn’t quite sure what to expect. I knew it dealt with time travel. I knew it was a cover shooter type game that paired gunplay with special time powers. I knew it somehow had a freakin’ live-action TV show embedded in it. These are all intriguing ingredients that had the potential to work together to create something extraordinary, or the potential to backfire big time. For me, it was the former. While the game is a cover-based shooter, at least on the surface, that’s not what it’s all about. Some people will judge a game even before playing it simply because it is a cover shooter, but that would be a mistake here. There’s enough going on to avoid that rinse and repeat feeling you can sometimes get from similar games. You will take cover to assess each new combat situation, figure out a plan of attack, and of course protect yourself from becoming dead, but enemies will flank you often in this game and spending too much time hiding, especially in the same place, does not work well. That’s where your special time abilities come into play. You have a variety of these abilities to use to your advantage, and moving in and out of cover while also using your powers is a far better strategy than remaining in one spot until all enemies are gone. When you feel confident enough to emerge from cover, stringing together two or three of these abilities to take out a wave of bad guys can be immensely satisfying. I won’t get into what the abilities are specifically, as they’re more fun to discover while playing, but using them in concert with whatever weapons I had gave me a nice blast of nostalgia for my days saving the universe as a Vanguard in the Mass Effect games. The main star of the show is of course that ambitious plan to bring together a video game and a live-action TV show mentioned above. So how does it work? It’s pretty straightforward, actually. You’ll play through an act of the game, and once you reach the end of that act you’ll face a junction. In this junction you’re presented with two important choices that steer the game in different directions. These choices are an interesting twist, as you don’t make them as the main character you’re playing the game as. This forces you to decide between what you think the character who’s choosing would do, and what you personally feel would be the best choice for the character you’re playing as. After you’ve made your choice, an episode of the show will begin. No, these are not hour-long episodes like you’d find on TV, but they aren’t short either—each is about 25 minutes long. For some this will be a difficult thing to accept, or maybe even a deal breaker for those who refuse to sit through a sitcom-long cutscene, which is understandable. I was very worried about it myself, but in the end I enjoyed them quite a bit. It’s unlike anything I’ve personally experienced in gaming. Would I want every game I play to have a mini live action show in it? Of course not, but it is a unique experience here that made Quantum Break all the more special for me. I also have to praise the overall design of the game. Again, I won’t give anything away, but when you’re dealing with time travel and control and manipulation things can get a bit wild. There’s something in the game called “stutters” in which time all around you stands still. Moving through a level where everything around you is frozen still is as surreal and awesome as it sounds. There’s also points where these stutters are unstable and time glitches occur, creating unexpected and dangerous obstacles to get past. I can’t imagine how difficult it must have been to make all of this work, but it does and does so spectacularly. And a bonus to having time glitches in your game: if there’s any actual glitches the stutters make them so much harder to notice in those areas. Pretty brilliant, Remedy. Those who worked on the sounds of Quantum Break did a great job as well. It’s something we don’t always notice, and some might not even care, but a game gets big points in my book when things sound like they should sound. It brings a huge smile to my face when I bump into or kick a random, meaningless item—a bit of wood, a plastic bucket, a sheet of metal, etc—that could have been avoided easily only to discover they still took the time to make sure that that item sounds like it should sound if someone were to contact it. The story and characters are interesting enough on their own, but they can get even better if you want to put the time in. Littered throughout the game are documents, e-mails, media, and more. Almost all of them help to develop the story and characters even more. Just for one example of this, there’s a document titled “A Civilian’s Guide to Time Travel” which goes into detail attempting to explain how time travel in this world works, and that added a nice layer of information for me. Diaries are especially good at adding to the story and characters, and many of them will be unlocked automatically, but some will require you find intel in the game. Read things, listen to the radio, read people who care not one bit about privacy’s e-mails, and your experience will be greatly enhanced. Some of the things you find will even play into the live-action episodes. You can keep track of how much each area has to find, how many you’ve already found, and even revisit any of them at any time, which is extremely helpful. This is doubly true for you Alan Wake fans out there. Remedy was sure to include lots of Easter Eggs for you to enjoy, but not all of them are actual collectibles so you have to find them without any assistance. Overall I greatly enjoyed my time with Quantum Break. It’s a fun cover shooter greatly enhanced by tremendous environment and sound design, an interesting story, and good performances by the cast. Add to that a built-in live-action TV show and it becomes one of the most unique entertainment experiences of recent memory. And with your choices altering how things play out, the option to go back and experience the story in different ways is there for you as well. It’s a hell of a ride, one definitely worth taking. Oh, and one last thing. Some filmmaker out there who’s a fan of this game better make Bruce Livingstone’s screenplay Time Knife into a real thing that we can watch! Preferably the guys who made Kung Fury.